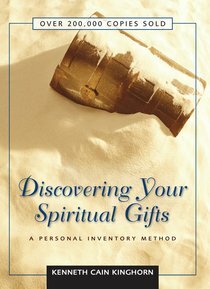 Discovering Your Spiritual Gifts: A Personal Inventory Method is designed to help Christians identify the specific gifts God has given them. While no Christian possesses every gift of the Spirit, every Christian does have some of God's wonderful gifts. And to be effective in ministry, Christians must find and use these gifts. This volume features an "inventory" of spiritual gifts designed to be taken either in a group or privately. This book will help clear up certain misconceptions about spiritual gifts and assist Christians in discovering the gifts God has within them. About "Discovering Your Spiritual Gifts"
Kenneth Cain Kinghorn is Professor of Church History and Historical Theology and Vice President at Large, Asbury Theological Seminary, Wilmore, Kentucky. SPANISH BIO: Kenneth Cain Kinghorn es vicepresidente vitalicio y profesor de historica en el Seminario Teologico Ausbury. Es autor de dieciseis libros. Su obra mas reciente esta compuesta por tres volumenes que transcriben los sermones estandar de John Wesley al ingles moderno, con introduccion a estos sermones.